Bearbeitet fur Soli, Chor und Orgel. Composed by Antonio Vivaldi (1678-1741). Arranged by Andreas Kohs. Stapled. Choir & Organ. Arranged for Soloists, Choir and Organ. Organ reduction. RV 610/611. 47 pages. Baerenreiter Verlag #BA07516. Published by Baerenreiter Verlag (BA.BA07516). ISBN 9790006525072. 27 x 19 cm inches. Language: Latin, Text Language: Latin. Preface: Christoph Heimbucher. 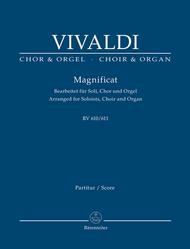 Antonio Vivaldi's Magnificat in G minor has come down to us in two conflicting versions. 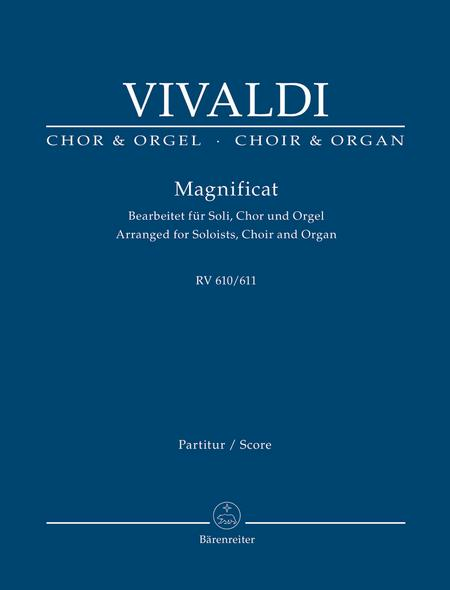 The earlier one, probably the original version (RV 610), is dominated by impressive but largely straightforward choral passages set against a few brief vocal ensembles manageable by soloists from the choir. In the later version (RV 611) the solo parts and one chorus are replaced by demanding virtuoso arias. Andreas Kohs arrangement for soloists, chorus and organ allows performers to choose between these two versions and is equally suitable for use in church and concert hall. Excellent service - thank you! Up till then I was coping in rehearsals with a shortened version with "?24 bars" and then singing for another few before more gaps, and this makes the work very fragmented, so delighted to have the full copy to work from.